There are few things in life that go better together than blues and whisky. 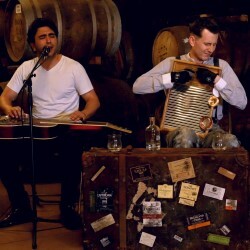 So join duo The Rhythm and Booze Project as they play a set of their stomping blues music, serve you three superb single malt scotch whiskies, and teach you a thing or two about appreciating the finest drink ever made. Whisky, music and mischief. It doesn’t get better than that. 'The Rhythm and Booze Project's unique approach to playing the best blues and serving the tastiest whisky will truly lift your spirits' (Whisky Magazine).